Directory & Info for Fishing, Angling, Fishing Tackle, Fishing Guides, Fly Fishing, Bass Fishing, Sports fishing, Game Fishing. Info on All types of Fishing | Angling | Fishing Tackle etc. Yabbies are freshwater crayfish which are distinguished from others by having 4 low ridges along the head and a short smooth rostrum. Their claws are broad and spade-like, with serrations along their inner edge. The claws are sometimes covered with a matt of fine hairs. Body colour ranges from pale to dark brown and there is a distinctive mottled pattern on the outer edge of the claws. Yabbies are widely distributed throughout central and southern inland Australia. There is also a translocated population in the south-west of Western Australia. Temperature limits for yabbies are between 0°C and 36°C. Yabbies can survive periods of drought by burrowing in damp soil and they remain in their burrows until the next rains. Yabbies spawn from October to March, with peak activity between December and February. Spawning is induced by an increase in day length and water temperature (above 15°C) It is not uncommon to find 1000 eggs on a large female. Following spawning, the female carries the eggs under her tail, where they incubate for 3 weeks. Like all crustaceans, yabbies have to moult as they grow. The frequency of this decreasing as they grow older. Weight can increase by up to 50% with each moult. Feeding activity peaks at dusk and dawn. Their diet is mainly detritus, plant material and small invertebrates. Yabbies are cannibalistic and smaller animals often are eaten by larger animals. Yabbies are also preyed on by fish, water rats, fresh water tortoises and water birds. Water birds, particularly Cormorants, can be a major pest in commercial aquaculture operations. Yabbies are fished commercially. They are taken wild, but there is an increase in farming yabbies. Crayfish can crawl forward at a very slow and awkward pace but can swim backwards extremely fast to get away from predators. Their spines point forwards to make them more streamlined for swimming and harder to grab by predators. How to tell the difference between male and female yabbies? Females have rings on their third last pair of walking legs. Males have short projections on last pair of walking legs. Males are generally larger than females, and females are broader in the tail. Catching with meat and string.Tips with this method are to use white cooking twine as your string, which is easy to see and sinks (builders twine and other synthetic twine floats), to use meat without much fat so it sinks, and to have a net to scoop the yabbies when you have them at the edge of the water. The traps to use are the ones that fall flat on the river or lake bed, allowing yabbies to climb over the bait, and then form a funnel again when they’re hauled in. Video showing how to make a Yabby Pump. Yabbies have a Light-flavoured, moist meat with a firm texture. The red-claw is cousin to the freshwater yabby and are about the size of a large prawn. 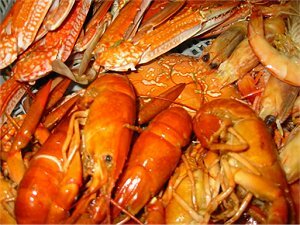 Nutritional information for Yabbies, Crawfish and Crayfish. 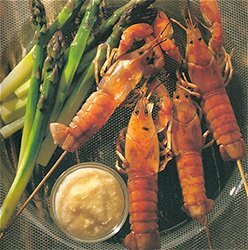 Yabby recipes and cooking information. Videos showing how to cook yabbies. Where to buy yabbies. The Yabby is a freshwater crayfish native to Australia. Also known as a crawchie, crawdad, craybob or even lobbie, it's all dependent on where you come from. 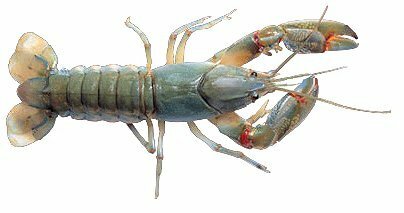 Yabbies as a name can refer to any number of different crayfish species (small smooth shelled species) but as a rule it generally refers to Cherax destructor. Farming and handling of Yabbies videos from Fisheries Research. Companies and contacts of Yabby Exporters, importers, processors, wholesalers and Seafood agents. Aquaculture Farming of Yabbies, information on spawning, environment, diet, growth, yabby health issues, economics of production. Publications and information on popular freshwater and saltwater aquaculture species: Ornamental Fish, Silver Perch, Black Bream, Red Claw, Trout, Yabbys, Marron, Mussels, Pearls, Western Rock Lobster, Trochus, Abalone, Barramundi, Fin Fish, Prawns. Information on sexing of male and female yabbies.